This one is interesting. Just look at the graph. 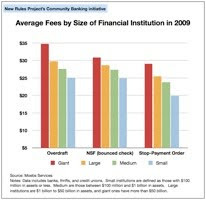 Bigger banks charge consumers more, in contrast to the received wisdom that bigness yields economies of scale and helps banks cut costs and so on. "Testifying in support of the so-called Financial Services Modernization Act in 1999, Michael Patterson of J.P. Morgan used the word "consumer" no less than twenty-one times in his remarks. He told Congress that freeing up big banks to get even bigger would provide consumers with "greater convenience, more innovation, and lower costs." "Why are small banks and credit unions a better deal? One reason is that they really want your deposits. Unlike big banks, which have access to wholesale funding, community banks rely much more on customer deposits to finance their lending and investments." They might have teased this out some more. Bigness in banking terms is also closely correlated with offshore-ness. And offshore-ness directly impacts on the factors outlined above, namely use of wholesale funding, and reliance on customer deposits. OK, the links are complex and messy, but it seems a fair conclusion to draw. As we've said, tax havens cause poverty.